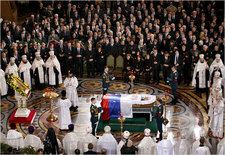 Yuri Kochetkov/European Pressphoto Agency The funeral was held today in the Christ the Savior Cathedral in Moscow. Associated Press Honor guards standing by the coffin today inside Christ the Savior Cathedral. Pool photo by Alexander Zemlianichenko Former President Boris Yeltsin's widow Naina, center, with their daughter Tatyana, left. Pool photo by Dmitry Astakhov Attending Boris Yeltsin's funeral in Moscow today, from right: Lyudmila Putin, next to her husband, President Vladimir V. Putin, Prime Minister Mikhail Y. Fradkov, Defense Minister Anatoly E. Serdyukov and Boris V. Gryzlov, the speaker of Parliament. 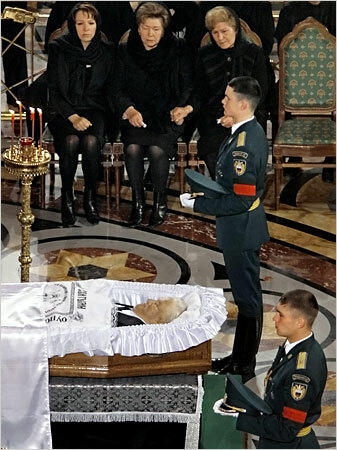 Pool photo by Alexander Zemlianichenko Yeltsin's widow, Naina, front, followed by his daughter Tatyana at the coffin today. Presidential Press Service, via Reuters Former U.S. Presidents George Bush and Bill Clinton at the funeral today. Dmitry Beliakov/Bloomberg News The hearse containing the body of former Boris Yeltsin leaving the Christ the Savior Cathedral today. 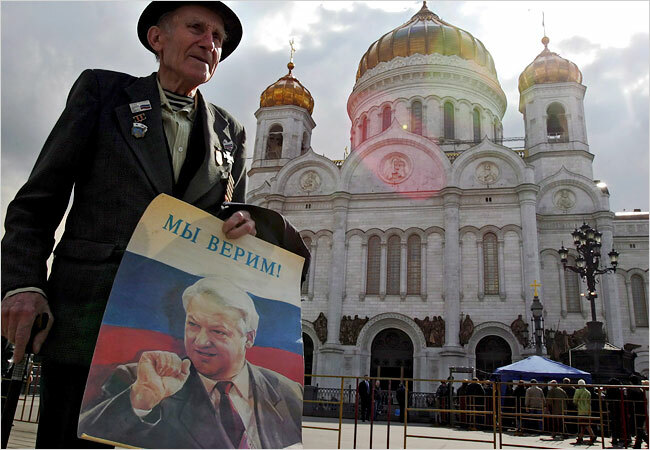 MOSCOW, April 25 ― Russia today buried Boris N. Yeltsin, the country’s first democratically elected president, after a somber, symbolic funeral service that was attended by Russia’s political elite, current and former world leaders, and his family and close friends. 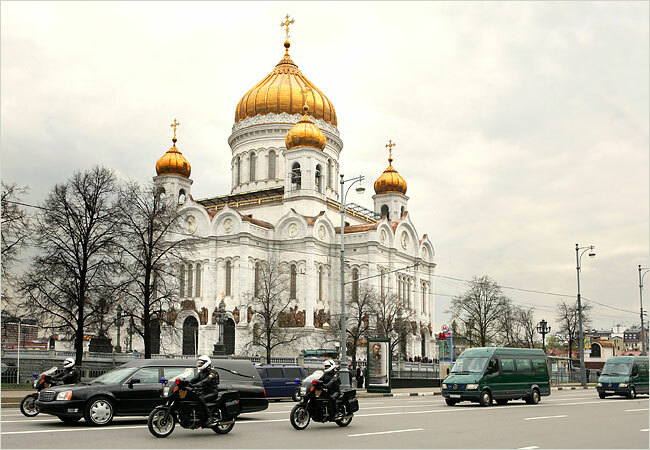 The service was held in full accordance with Orthodox Christian tradition in the Christ the Savior Cathedral, whose reconstruction Mr. Yeltsin approved while he was president after it was destroyed during the Communist era. During the service, Mr. Yeltsin’s open casket lay beneath the cathedral’s massive frescoed dome and was draped with the Russia tricolor. Clergy intoned prayers over the body, as a teary-eyed Naina I. Yeltsin, Mr. Yeltsin’s widow, and his two daughters, dressed in black, looked on. Mr. Yeltsin, who helped bring down the Soviet Union as an opposition leader and then presided over a tumultuous and controversial nine years as president, died on Monday of heart failure at a hospital in Moscow at the age of 76. 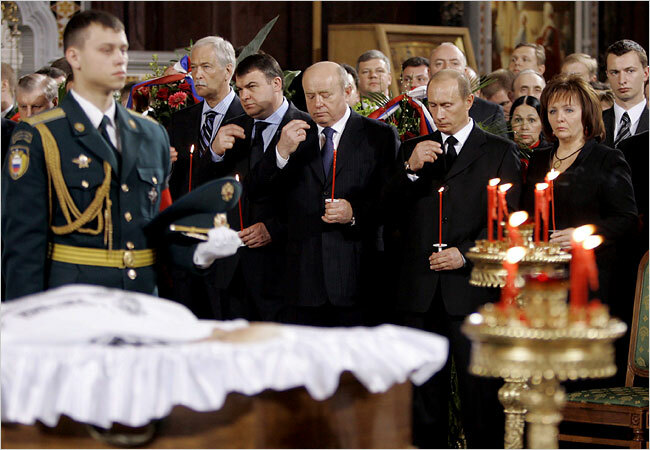 Russia’s current president, Vladimir V. Putin, attended the funeral, along with most members of the Russian government, including two potential successors to the presidency, the two first deputy prime ministers, Sergei B. Ivanov and Dmitry A. Medvedev. 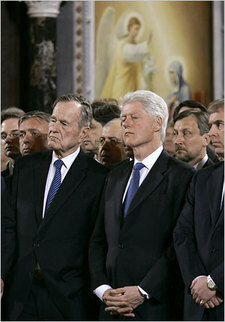 Foreign leaders including former American presidents George H.W. Bush and Bill Clinton flew to Moscow to pay their respects to their departed colleague. Not since the death of Czar Aleksandr III in 1894 has the Christ the Savior Cathedral officially been used for the funeral of a Russian head of state. The czar’s son, Nikolai II, was murdered with his family after the Bolshevik revolution in 1917 and buried in a secret mass grave, after which the new Soviet government effectively put a stop to religious life in the country. After the ceremony, funeral attendees accompanied Mr. Yeltsin’s body under military guard to the Novodevichy Cemetery where he was to be interred. There, he will lie in the company of other mavericks, cultural and political, including the Soviet writers Mikhail A. Bulgakov and Boris L. Pasternak and Nikita S. Khrushchev, the Soviet leader who, like Mr. Yeltsin, left office humbled and with a taint of official shame. Mr. Putin, whom Mr. Yeltsin appointed as head of state when he resigned on New Year’s Eve in 1999, declared today an official day of mourning, and, in a sign of the Kremlin’s increasing grip on the country’s media, ordered television stations to cancel entertainment programs and to broadcast the funeral service live. Beginning Tuesday afternoon, thousands of Russians and foreigners came to the cathedral here to pay their respects to Mr. Yeltsin during a public wake. Awaiting entrance to the cathedral on Tuesday was Kirill B. Mikhailov, who, in August 1991 at the age of 18, he said, spent three days outside the White House in Moscow, supporting Mr. Yeltsin as he took on the organizers of a coup to oust the Soviet leader Mikhail Gorbachev. “He rid us of communism; he gave us freedom,” Mr. Mikhailov said. “Yeltsin was the embodiment of a new freedom, a new spirit,” said Vera A. Colman who was also among those who came to say goodbye. Indeed, after his initial triumph over the Soviet Union, Mr. Yeltsin led Russia into an era that at times bordered on chaos. His order to shell the Communist-controlled parliament in 1993, the decision to invade Chechnya in 1994 and the country’s 1998 economic crisis weakened him politically and marred his legacy. In a sign that political scars from the 1990s have yet to heal, members of the Communist Party, Mr. Yeltsin’s main political opponents during his presidency, refused to rise during a moment of silence held before the start of today’s State Duma session. By contrast, the Kremlin-controlled media gave extensive, emotional, even intimate coverage of the proceedings. At the cemetery, state television showed how Mr. Yeltsin’s widow approached her husband’s open casket, patted his head, and gave him one last kiss. The former US presidents Bill Clinton and George Bush senior will be among a host of world leaders expected to attend the funeral in Moscow tomorrow of Boris Yeltsin, the Kremlin announced this morning. Mr Clinton and several other "prominent political figures" will pay their respects to Yeltsin, Russia's first democratically elected president, who died yesterday of heart failure at the age of 76, the Kremlin said. Members of the public will also be able to pay their respects to Yeltsin later today at the Cathedral of Christ the Saviour. 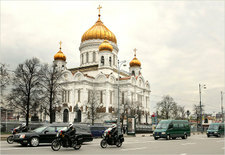 The church, near the Kremlin, was blown up by the communists and rebuilt under Yeltsin's presidency. "He will lying in state of the second half of today," a Kremlin spokeswoman said, adding: "It will be open to the public." Vladimir Putin - Yeltsin's successor - has declared tomorrow a day of state mourning. 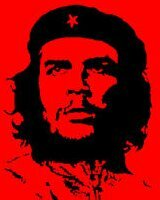 He has ordered that all flags be flown at half-mast and postponed his annual state of the nation address until Thursday. After a funeral service in the Cathedral of Christ the Saviour, Yeltsin will be buried in Moscow's Novodevichy Cemetery, the Kremlin said. The cemetery, close to the Moscow river, and next door to a baroque 16th and 17th century convent, has been the traditional burial place for Russia's elite during both Soviet and non-communist times. The former Soviet leader Nikita Khrushchev and composer Dmitry Shostakovich are buried there. 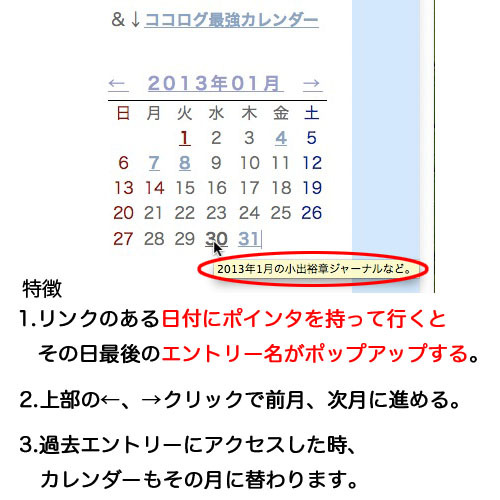 So is the novelist and playwright Mikhail Bulgakov, the author of the Master and Margarita. This morning guards refused to allow the Guardian inside - but revealed that a spot is being dug for Yeltsin close to the grave of Raisa Gorbacheva, Mikhail Gorbachev's wife. He is to be buried in a quiet corner in the west of the cemetery, surrounded by firs and larches. Since his death yesterday morning Russia's state-controlled television has depicted Yeltsin in hagiographic terms - portraying him as a great man who, unusually for a Russian leader, gave up power voluntarily. But the mood on Moscow's streets has been less forgiving, with many Russians associating his rule with economic disaster. Today's Russian papers also bluntly noted his shortcomings - economic turmoil, a disastrous war in 1994 against Chechen rebels - and recounted his embarrassing drink-fuelled gaffes. "The man who gave people new life and new opportunities to pursue their dreams also - and this was important to him - removed fear from people's hearts," the Nezavisimaya Gazeta said. 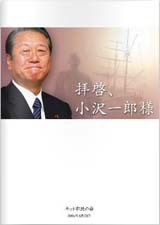 It added, however: "People saw their difficulties in adapting to a new way of life as the blunders of the country's leader. And as people no longer had fear, the head of state was ostracised by just about everyone." Many of the newspaper tributes to Yeltsin viewed him through the prism of seven years under Mr Putin who, critics say, has rolled back many of the democratic reforms his predecessor introduced. "Boris Yeltsin said that he was leaving Russia to 'a new generation of politicians', under whom the country 'will never go back to the past'. But over seven years of his presidency Vladimir Putin has proved that a return to the past is possible," said the Kommersant newspaper, suggesting that Mr Putin has turned Russia back into a traditional authoritarian state. There was also acknowledgement of Yeltsin's shortcomings, including a privatisation drive that handed state assets to loyal business moguls at rock-bottom prices and pauperised everyone else. 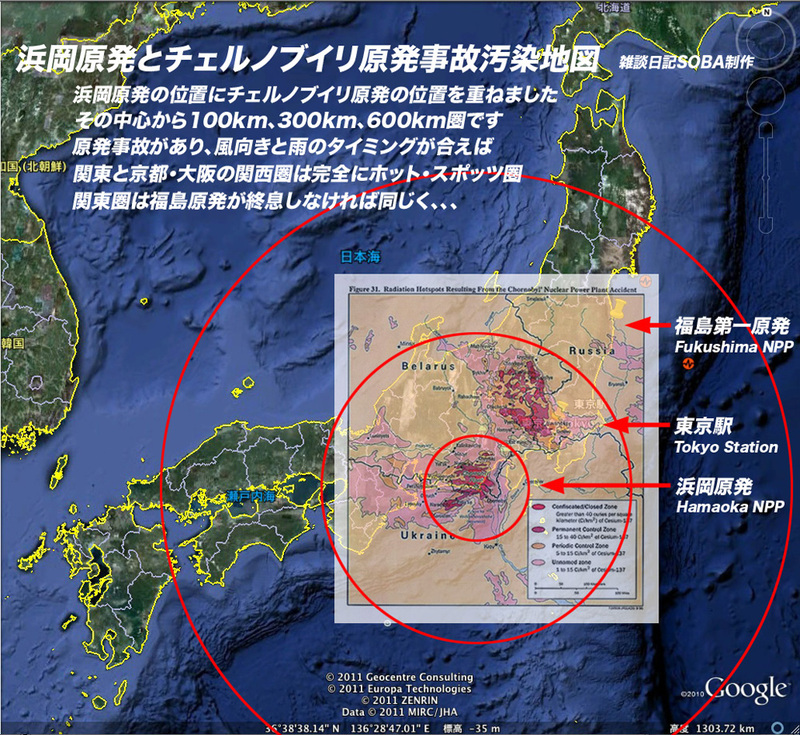 "The malevolence of fate: everything he initiated turned out the opposite way round. 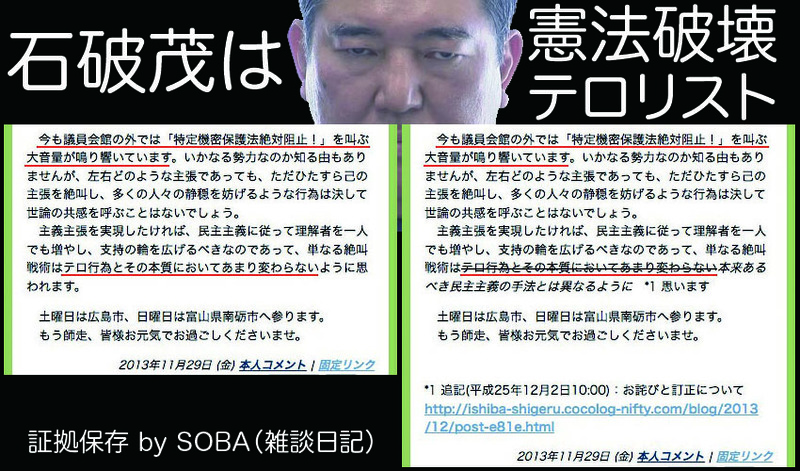 He wanted to make many rich but only enriched a few," said the Moskovsky Komsomolets newspaper. Alluding to Yeltsin's penchant for alcohol, the paper said: "He had one personal weakness, which is understandable and forgivable for Russia. And it wasn't this weakness that ruined his authority but the war [in Chechnya] and privatisation."